The Game of the Year title was voted for by senior writers at 25 news organisations including Wired and IGN. The decision has been criticised on some internet forums because of bugs which appeared to be particularly problematic in the PlayStation version. Skyrim's developers said they were working on a solution and asked for "patience". 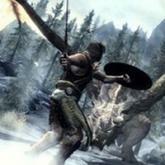 Skyrim is the fifth instalment in the Elder Scrolls series. The open world game has an estimated 300 hours of playtime during which the gamer explores a huge landscape, fights dragons and other beasts and pursues quests. Critics have praised its sense of scale and atmosphere, but have highlighted technical glitches. Nevertheless, Bethesda Game Studios was named studio of the year and won the Best RPG (role-playing game) award in addition to the top prize at the weekend's ceremony in California. The news has created a backlash on some gaming blogs with users complaining the title is "unfinished" and "broken". Gamers have complained of dragons flying backwards, spells not working as they should and computer crashes. However, user-feedback suggested that the biggest problem was that the game slowed down to the point it became unplayable on the PlayStation 3 as players progressed through the title. Games review website IGN said a poll of its readers suggested about a third of PS3 owners who had the title were experiencing issues with lag. "The bigger your save file gets, the slower the game is running, and so it's getting to the point where people who have been playing the game for 20 or 50 hours actually can't play it any more because the frame-rate is so low," said Keza MacDonald, UK games editor at IGN. "The general consensus among the development community is that this is an engine-level issue, which means it's really difficult to fix, and means it may be a significant time commitment from Bethesda to fix it on the PS3." Bethesda's blog said that while the memory issues would not be fixed in the next software update, it did plan to address the issue. "We understand how frustrating it can be when your game is having issues, and we thank all of you for your continued feedback and patience. Rest assured we take your gameplay experience seriously and will continue working on this until it's resolved," it said. The firm's marketing boss has also played down claims that the PS3 problem is related to a games engine flaw experienced in one of its earlier titles. "[The] comments don't reflect how the current tech works," tweeted Pete Hines. However, gaming journalists believe the firm still needs to provide more detail. "These [types of] games are comprehensively quality assured and tested for up to six months to a year before they come out," said Ms MacDonald. "The question is whether a decision was taken to deliberately release the game in a slightly broken state on the PS3 to avoid the revenue loss that would have happened if they delayed the game, or whether it's an issue they were genuinely unaware of." Ms MacDonald added that Skyrim's "artistic achievement" meant it still deserved game of the year status. A spokesman for Bethesda told the BBC that the firm did not have any information to add beyond what was on the blog at this time. According to the research group NPD $1.74bn (£1.11bn) of videogame discs and cartridges were sold in the US in November, a 16% increase on last year. Skyrim was the second best-selling title after Call of Duty: Modern Warfare 3. "This November marks the best November on record for sales of new physical content," said NPD analyst Anita Frazier. "In one month, Elder Scrolls V: Skyrim is just about half a million units shy of matching Elder Scrolls IV: Oblivion in lifetime sales. Its first month performance was a five-fold increase over Oblivion's first months sales."